While not being particularly photogenic, this curry started out with promise–easily identifiable pieces of nice veggies like butternut squash, courgette (can I just say zucchini?) and red pepper with lentils. In the eating, however, this dish failed to wow. 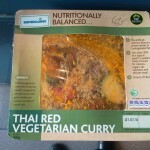 The curry was bland overall. The butternut squash provided the most flavorful bites, but at the same time was almost too sweet. The spinach was skimpy and I had to reread the package to remind myself there was quinoa. Let the quinoa shine, people. The meal’s texture bothered me as well. 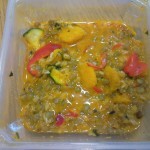 I long not for mush, but the courgette seemed too crunchy and the lentils (or rice?) was a bit hard. The curry may have started out on a bed of rice, but after being transported to work there was no distinguishable layering to this dish. I imagine there is an expectation that curry is served with rice, but the dish would be more interesting with more quinoa and no rice. The dish was not unpleasant, and an addition of goats cheese livened it up nicely. I found the serving size to be filling.